19 Jun 2013 in aliens book review dystopian science fiction young adult books young adult fiction ~ read. Plot: Nearly 7 billion people are dead, almost the entire population of the world, killed in four successive waves of destruction sent by the aliens. Cassie Sullivan has lost everyone she loved, all dead — except possibly one, and to that one she made a promise that she intends to keep no matter what the cost. Seventeen-year-old Zombie has lost everything and everyone, too. He failed to protect his sister when she needed him, and now he has no desire to go on. Then Zombie is given a new purpose and a chance to redeem himself when he’s recruited into a newly formed military unit comprised entirely of children and teens being trained to fight back against the alien invasion. These teens, and the other few remaining survivors must make a choice. To hide. To run. Or to stand and face whatever comes. To choose to be human, even when it’s the hardest choice of all. 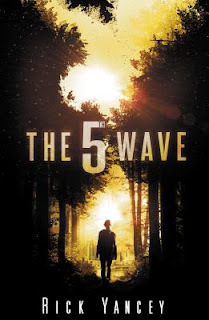 The 5th Wave is a remarkable story and a remarkably well-written book. With excellent character development, rich sensory language, layers of reveals, a surprisingly sweet (and hot) romance, and some dystopian elements, it’s a science fiction book that even people who don’t read science fiction can enjoy. It’s an unusual creature: a thrilling page turner with philosophical underpinnings. It’s a book that you can read more than once and get something different out of it each time (I read it a second time immediately after finishing it, and would still like to read it a third time when I get a chance). The writing is complex, with multiple point of view characters and extensive flashbacks that circle around on themselves. Different characters’ experiences conflict with each other, leaving the reader (like the characters) wondering exactly what the truth is. While that’s a plus for many people (it is for me), there are some readers who will find it challenging and difficult to understand.